We were lucky to get some snow out of the miserable storm that just came up the east coast. The results of yesterday's sleet storm froze and then we received about three inches of snow on top of that slab. Skiing at Mount Van Hoevenberg should be great once they get everything groomed. Today was supposed to be a backcountry day for me, but I hate breakable crust. 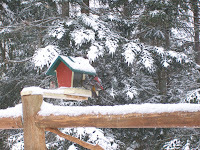 No worries though, this is typical early spring weather and conditions in the Adirondacks. We have a lot of fantastic skiing left. In a good year we can ski into early May. There are other pleasant aspects to Adirondack Spring besides skiing, I guess. The birds have started their incredible singing, but are still pigging out at the feeders. Featured today are the Pine Grosbeak couple. It still looks very much like winter here, but one can't ignore all those little signs reminding we are easing into spring. That means, ski, ski, ski!